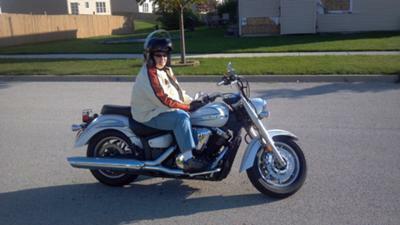 Here I am on my first ride after getting my motorcycle license in September of 2011. I'm riding the Yamaha V-star 1300 that we originally bought for my husband and I very quickly took over after getting my license and determining that he needed a big bike. I was riding around in my neighborhood while my husband stood outside the house. When I came back to the house, I asked him if he felt like he was saying good bye to his bike. He laughed and said now it would cost us another bike. I'm hoping to pick him up something larger this year and then we can ride together. I was sorry I hadn't gotten my license years ago so that I could have ridden with my father while he was alive. I rode with him on a variety of motorcycles and scooters as a kid and forgot how fun it was. My husband was very proud of me at this point - he had a great experience in the HD Riders Edge course and encouraged me to take it, and I was proud to pass my exam on the first shot. I am looking forward to spring weather and to be able to get out and ride. Good for you Deb & a really nice bike! My husband rides the Royal Star Tour Deluxe, which I believe is the touring model of the 1300. He loves it too. Please keep us posted on your riding adventures come springtime. I told my husband when he got his new bike, "I ain't riding behind you!". We would race home after work to beat each other to the bike. We bought another bike in two weeks. Now it's 3 years and 55K miles later we love it. Best thing for our relationship. And yes, sure wish I had started earlier! ya there is nothing better than riding your own, enjoy.!! !